We are calling on people around the world to create a “Million Acts of Blue”. 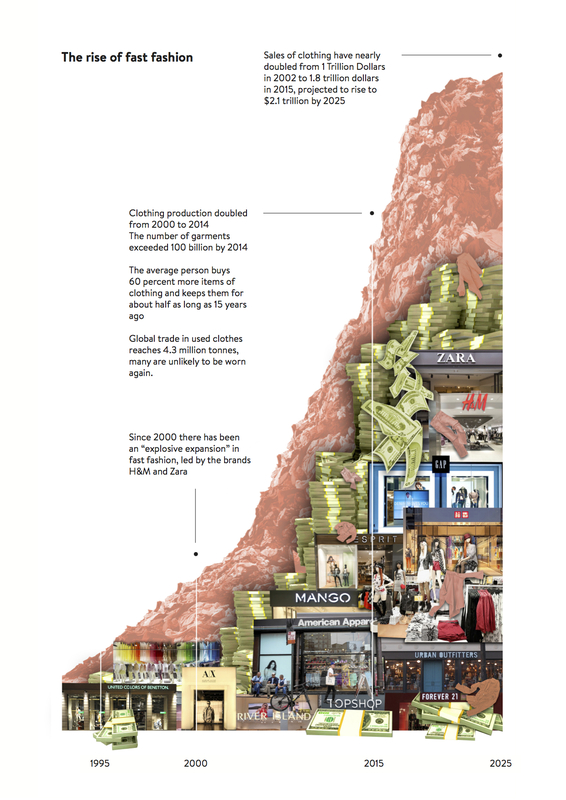 The expansion of fast fashion wouldn’t be possible without polyester. Relatively cheap and easily available, polyester is now used in about 60% of our clothes. But, if we take into account the fossil fuels used in its production, CO2 emissions for polyester clothing are nearly three times higher than for cotton! Our reliance on polyester is one of the reasons why the fashion industry is one of the most polluting industries in the world; both in terms of its emissions-heavy production and the non-biodegradable waste it leaves behind. Once our clothes reach a washing machine, the synthetic fabrics release tiny strands: so-called microfibers. These are essentially microscopic pieces of plastic, just like the microbeads you find in cosmetics. Every time you run your washing machine, hundreds of thousands of microfibers are flushed down the drain. Many reach beaches and oceans where they can remain for hundreds of years. Swallowed by fish and other sealife, microplastic travels up the food chain, where they end up on our plates. 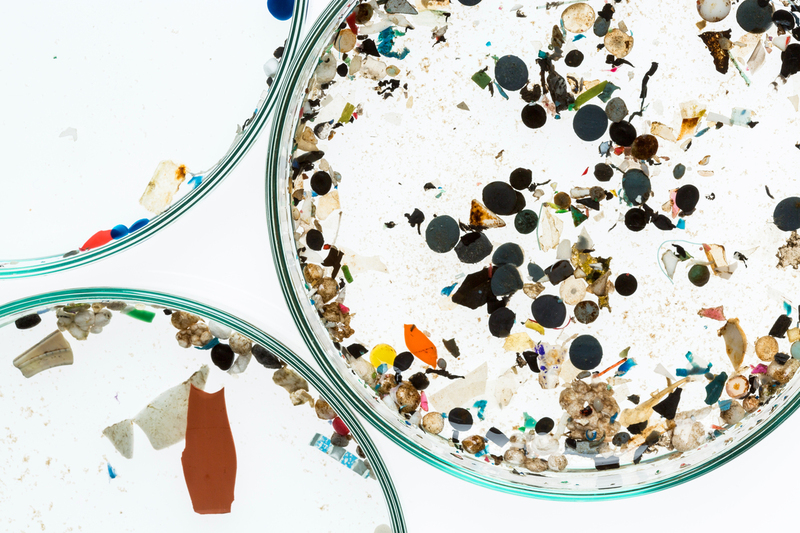 According to a new IUCN report, microplastics could be causing even more of a problem than we thought. Between 15% to 31% of marine plastic pollution could be from tiny particles released by household and industrial products, rather than larger plastic items that degrade once they reach the sea. The IUCN calculates that 35% of this microplastic pollution comes from washing synthetic textiles. Europe and Central Asia alone dump the equivalent of 54 plastic bags worth of microplastics per person per week into the oceans. It’s unrealistic to think that we can get rid of synthetic fibers altogether. Their use is too widespread and the sheer volume of clothing that we produce simply can’t be manufactured using only cotton and other natural fibers. And while the manufacturing industry is developing solutions; like more efficient filters for washing machines, they don’t yet tackle the problem. We need to radically rethink the way we manufacture and use what we wear. 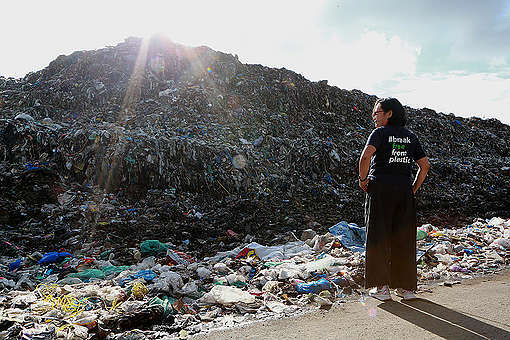 Clothes should be produced without polluting the environment. They should be designed with durability in mind, so that they can be recycled only after many years of use. As consumers we have a big part to play in preventing microfibers from polluting the oceans, simply by buying less. If we reduce consumption, we reduce waste. It starts with being more conscious of the issue, and the rest should be simple. Rethinking our buying patterns is possible. We already shop too much and wear our clothes too little. A 2015 survey by Greenpeace Germany revealed that about 40% of our clothes are rarely or never worn [in German]. We can change that. We can buy secondhand or vintage, make use of clothing exchanges online and within local communities, or up-cycle our existing clothes. Clothing doesn’t have to be brand-new to be fashionable. Visit Story of Stuff to find out more about microfibers and what you can do to help, and please share the video and spread the word! Dr. Kirsten Brodde is the Detox my Fashion Global Project Lead at Greenpeace Germany. Is it better to wear and wash the athletic wear I have or is it better to retire my athletic wear and buy hemp or 100 percent cotton. Please advise. As the researcher who first discovered this issue I find it offensive that there is no mention or reference to my work. Given that Nike and Patagonia both told me that they would not fund research because they were trying to remove chemicals from clothing that Greenpeace identified as toxic. Now they just simply replace old chemicals with lots of evidence of toxicity with new chemicals not identified as toxic yet. Thus green chemistry approach is problematic, companies are not engaging with rigorous research to mitigate thus problem and it is because of Greenpeace. Unfortunately companies are currently focusing on easy techno fixes like washing bags - please get in touch with me to get an update. Our rivers and streams are inundated with millions of storm drain's that relieve society, industry, and government of every foul matter. Used condoms, tampons, medical waste, dirty diapers, bottles, and bags. All this matter breaks down and absorbs PCB's which is being ingested by phytoplankton. Phytoplankton is the beginning of the food chain and creates most of our oxygen and is in a 40% decline. As phytoplankton goes we go. This issue is imminent and irreversible. Hi, I was wandering about your view on microfibre and ceaning. Is it better for the invirontment in totatl to clean the house with a (good quality?) microfibre cloth that last for years and water only? Or it is it better to choose a natural cloth in hemp og cotton and som kind of natural soap (that often comes in a plastic bottle)? Or are we all fooled to tink that we need any of this stuff... Is water and a cotton cloth all we need really?? It looks like there's a mistake in the statistics of this report. 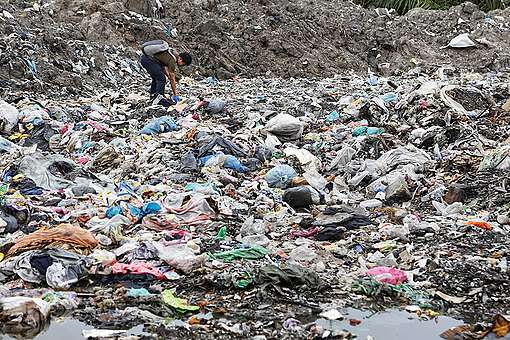 It is claimed that: "Europe and Central Asia alone dump the equivalent of 54 plastic bags worth of microplastics per person per week into the oceans." When you check the report cited, it becomes clear that this is misquoting the original report, which estimates 54 plastic bags worth microplastics per person per year into the oceans.' The report cited, moreover, makes it clear that this is estimating 5 grams per carrier bag, so around 270g per per person per year of microplastics. It's still a lot but eye-catching statistics that turn out to be exaggerations don't lend credibility to desperately needed arguments. 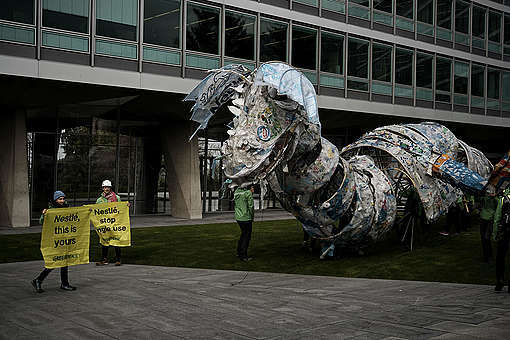 Greenpeace for decades and think that you do valuable work. accelerating at an alarming rate and will continue for PROFIT. This old hippie is worn out!